I kind of resisted reading this one for a while, based on the summary: 35 girls vying for the chance to be the prince's bride? It sounded like a YAF dystopian version of The Bachelor. I'm not a big fan of anything that furthers the societal notion that female relationships are fraught with contention and competition. I am not about that life, yo. But, I definitely wanted to see what the hype was about (since book #4 just came out recently), so I read it. America Singer is one of those chosen girls. She's a Five, so she's not the worst off, but she's definitely not one of the wealthy. 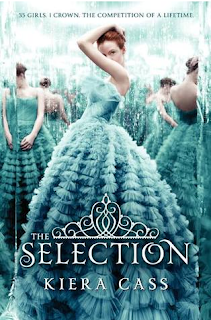 She didn't even want to apply for the Selection, especially since there is already a boy that she loves, but she gets pressured into it, and because she's our protagonist and therefore super special, she gets chosen. She assumes that Prince Maxon will be just another stuck-up, stuffy rich person, but she discovers that he's actually a pretty cool dude. Her impertinence is what gets her noticed immediately, since all the other girls are tripping over themselves to fawn over him. She tells him that her heart is elsewhere, but she needs to stick around because of the money, so she offers to help him navigate this whole Selection dating process since Maxon is woefully inexperienced with women, and as their friendship grows, some other feelings begin to grow with it. He is drawn to her humor and her refreshing honesty, while she is drawn to his goodness and sincerity. But royal romance is a complicated matter, and with rebel forces attacking the palace constantly, Maxon has to consider a lot more than just his feelings when choosing his future queen. And America is still in love with her boy from home, so that adds a layer of complication as well. The romance part was easy to get into; I found myself getting hung up on the society. Since you have to get quite a ways into the book before anyone fills you in on the origin and actual location/time period of this fictional country they're all living in, my mind kept bouncing back and forth between medieval times (because of castes and kings and queens and such) and something contemporary or even futuristic (since there are televisions, phones, and jeans). I felt like that part of the exposition was rather slowly rolled out, but once we got the full story of how things came to be (in an actual history lesson), I found it really, really interesting, and actually quite plausible. One thing I wasn't so sure about was the rebel attacks. Maybe I'd read over it too quickly, but I wanted to know what they were rebelling against, and though Cass goes to great lengths to depict the rebels as dangerous and scary, I was definitely thinking to myself, Well, if they're going to such great lengths to rebel, then maybe it's because they are desperately unhappy with the lives they lead. And maybe the royal family had a hand in that? So maybe I (the reader) shouldn't be so quick to trust Prince Maxon and his family after all. What if they're actually really horrible people who have no clue how much suffering is actually happening in their country? Well, actually... okay, while they're not actually horrible, there is an impressive moment in the book where America communicates (rather effectively!) to Maxon what it's like to be hungry, and he is so moved by this revelation that he actually does something about it. So that's pretty cool of him. Though it still doesn't answer my question about the rebels. I'm sure there'll be more about this in the sequels. So while I didn't LURVE The Selection, I did like it enough to want to keep reading the series. If I'm being honest, the romance parts are less compelling than the socioeconomic class issues that are being depicted, but only because the eventual selection has already been spoiled for me anyway. (But I'm curious to see what happens in the interim.) There are definitely catty-girl moments which I really hate reading, and it just makes me side-eye, but I can live with it. It's still miles better than actually watching bad reality television. See you soon with book 2!